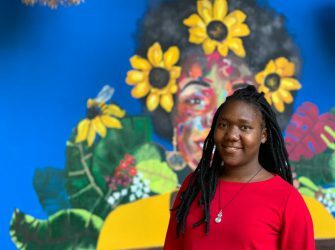 The idea behind our Walls of Art at Royal Chundu is not only to inject the colour, vibrancy and creativity that art brings with it, but to support and represent local even more. 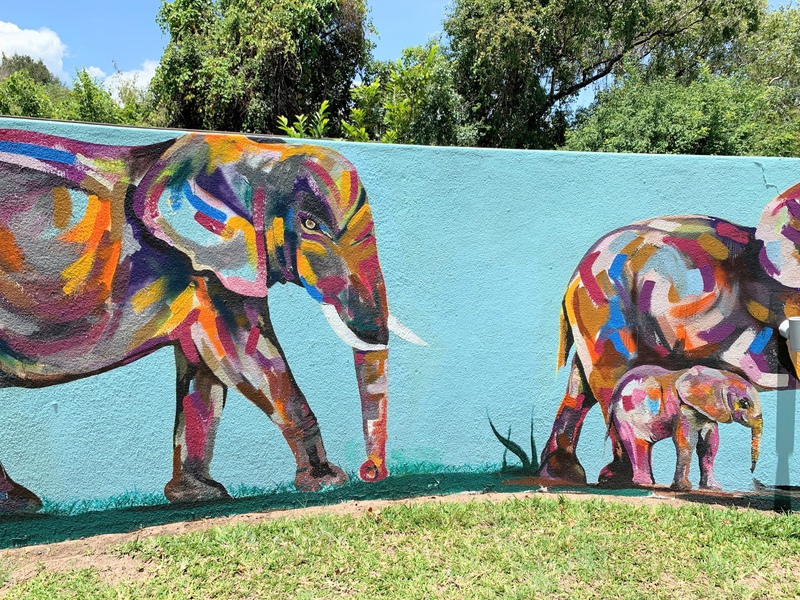 With our second wall by our local Zambian artist, Mwamba Chikwemba, the birds and bees and elephants of the Zambezi come to life in new bright and bold paint strokes around the swimming pool at River Lodge. Find out more about the inspiration and process in our catch-up with the artist of the moment below. 1. 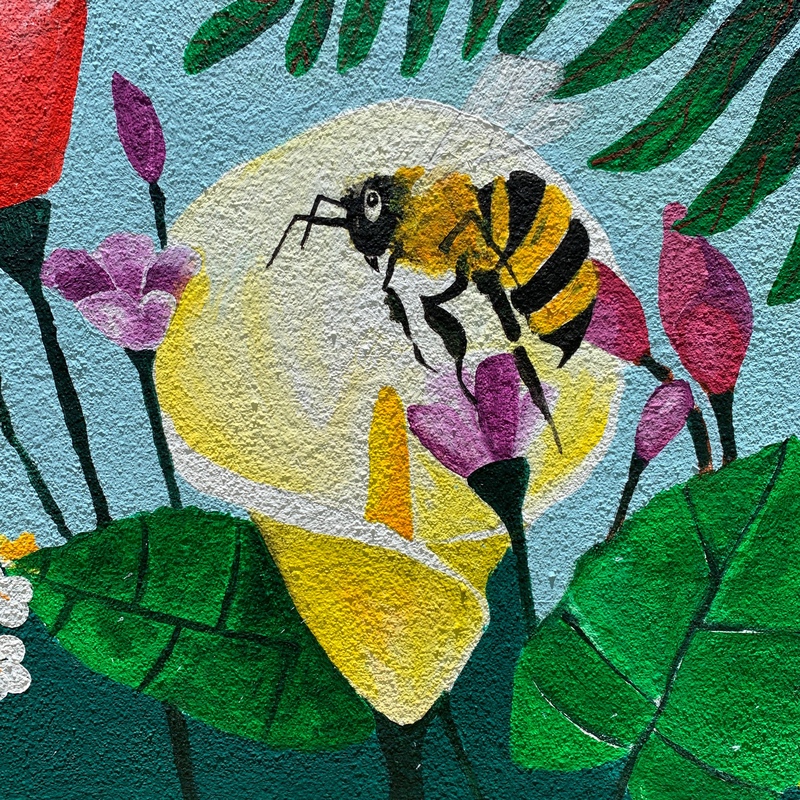 What was the inspiration behind the artwork around the pool? 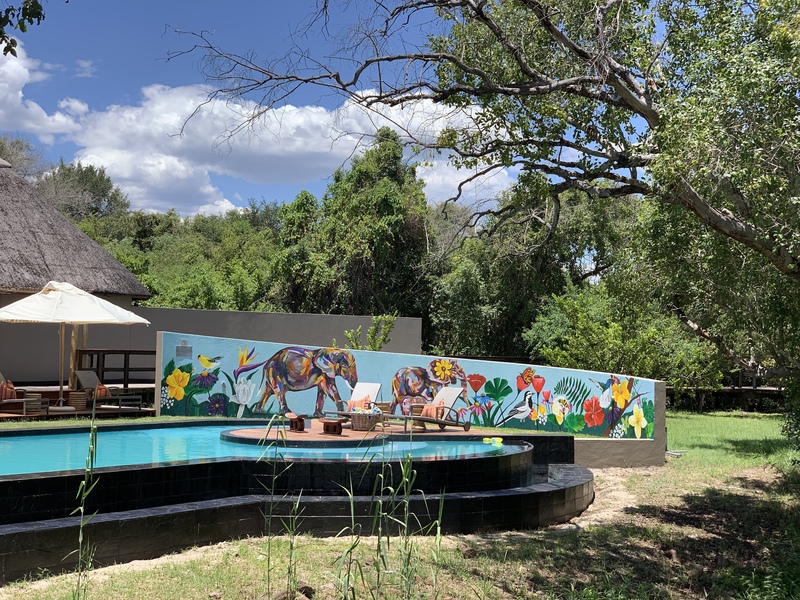 The mural by the pool is inspired by Zambian nature, the flowers, birds and colours I consistently saw during my stay at Royal Chundu. 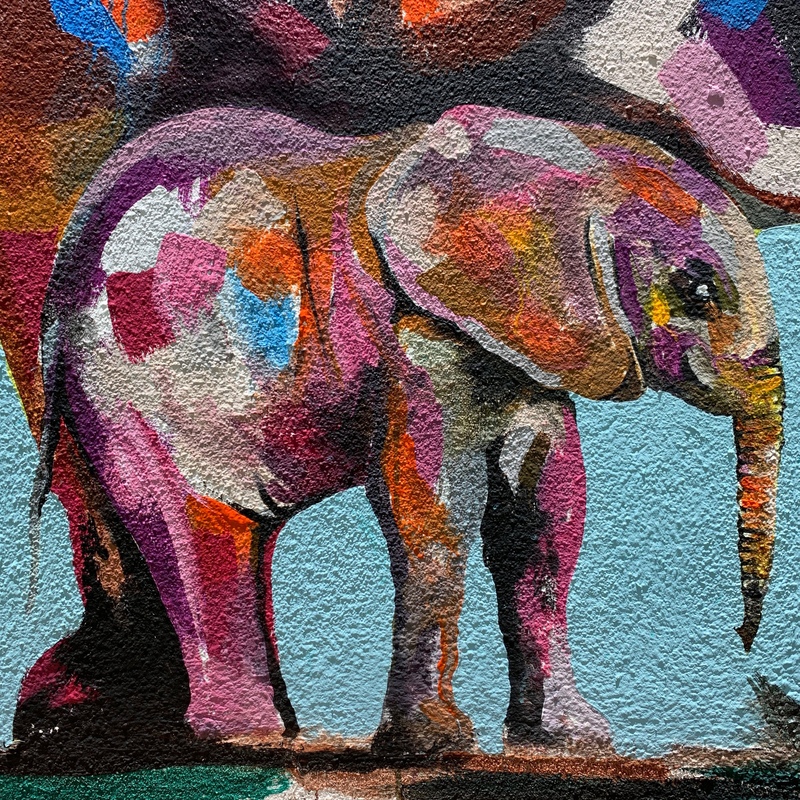 The idea of elephants came about when I arrived at the lodge because the first thing I wanted to see was elephants and it happened that the second day when I headed off to buy my materials in town, I saw them on my way back. It brought so much joy to me. 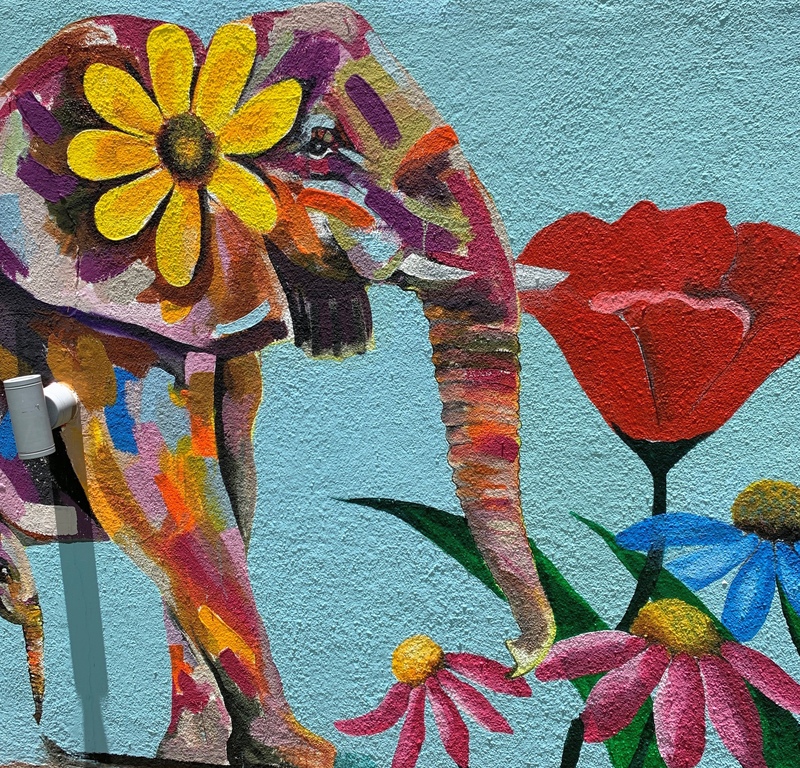 I hope people who see the mural will feel the happiness I did when I saw these beautiful animals. 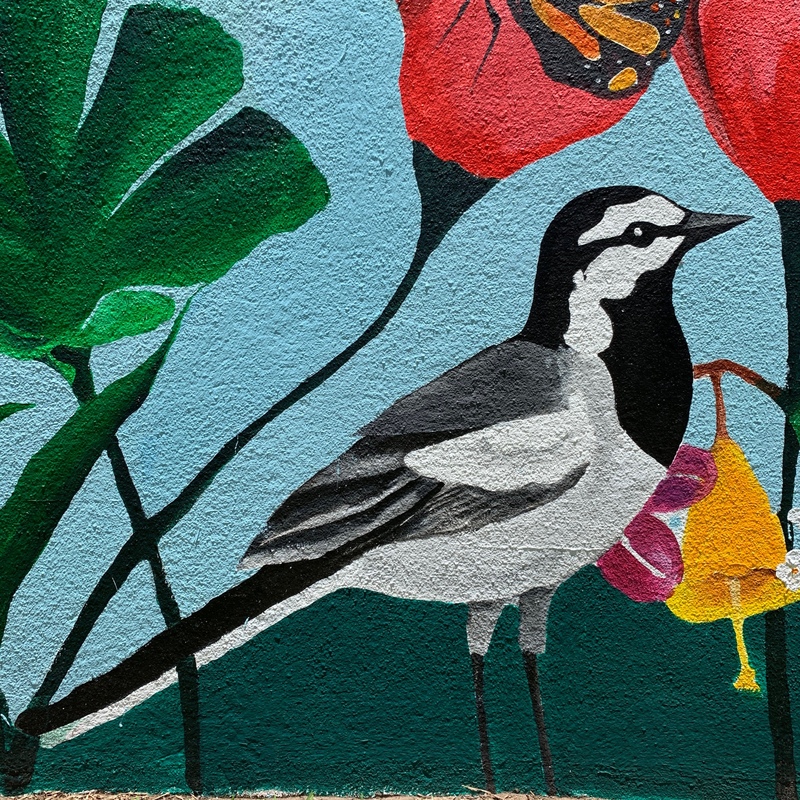 The wagtail bird on the mural is special to the place too. 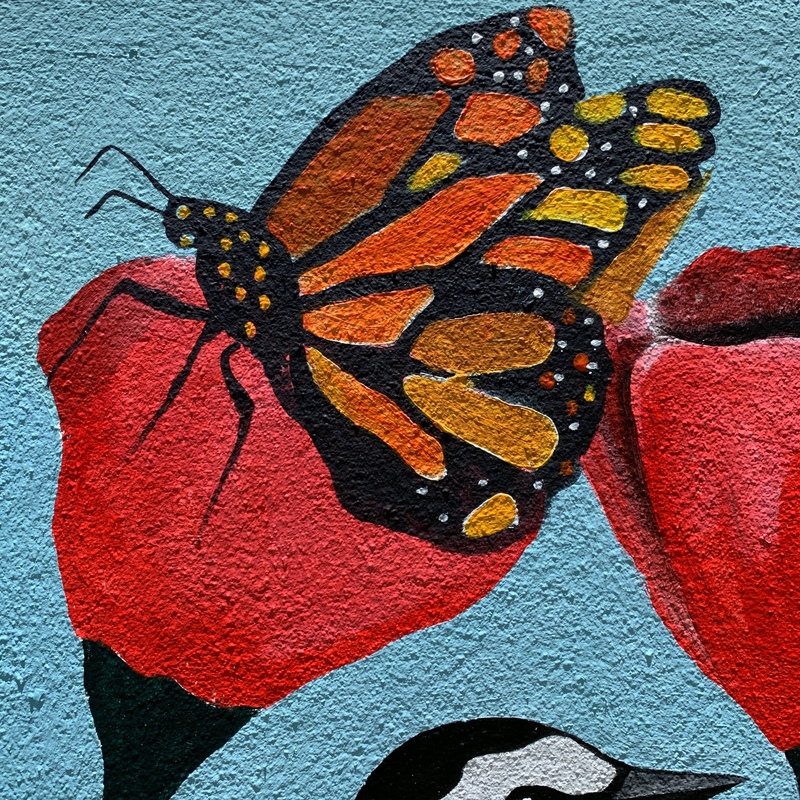 Upon starting to paint the mural it kept coming to the pool and it naturally inspired me to incorporate more birds in the artwork. 2. Can you describe the artwork for us? 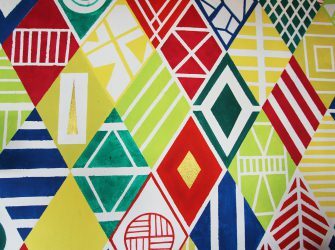 I don’t know how I can describe this work except to say that it is full of joy and happiness and love, because my stay at Royal Chundu was full of happiness and love and for me art is about expressing my emotions. 3. What do you hope it will inspire in people who see it? I hope it reminds them how important and how beautiful nature is and how joyful, peaceful, loving and friendly Zambia and Royal Chundu are. 4. 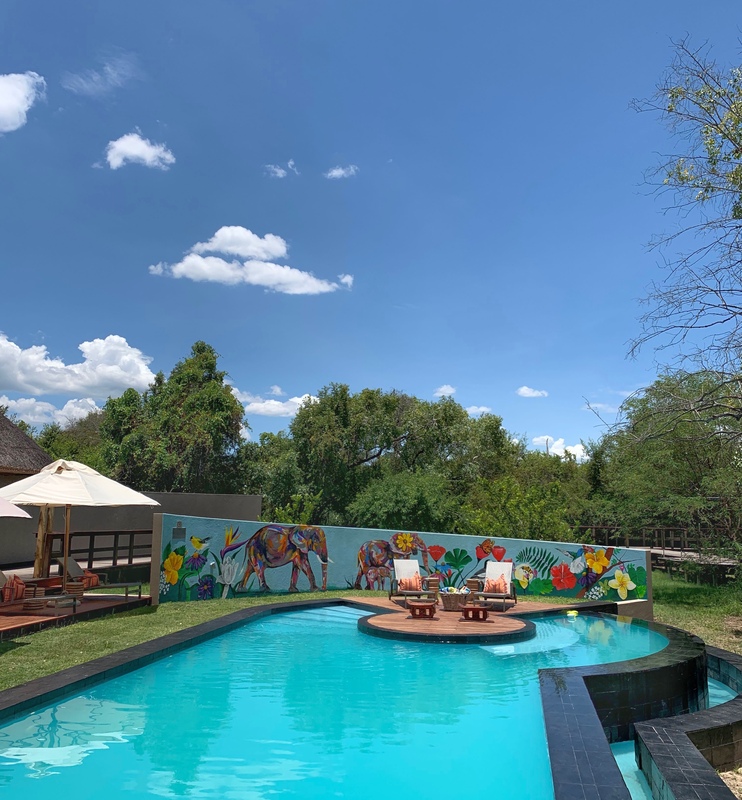 What has your experience of staying at Royal Chundu been like? My stay at Royal Chundu was wonderful and so meaningful. I had the best moments of my life there and I feel/felt very at home. Everyone was welcoming and loving. It is special. Every day was a highlight. I loved seeing the beautiful sunset and sunrise everyday on the Zambezi. I loved joining Tina and her family on a sunset cruise on the river. It was my first time. It was so beautiful with the birds and getting to check out the animals. I truly got a sense of the river and region. One of the mornings, Tina took me for an early sunrise. It was so peaceful, inspiring, so amazing. I learnt a lot every time I was with them, and had great fun. Another highlight was canoeing on the Zambezi for the first time. We stopped for a picnic too. For Christmas, Tina invited me to be a part of the Christmas Dinner with some of the managers and her family and the children. This was so special. I loved also getting to stay at the Island Lodge for almost a week. I felt like I was on a vacation, because it was so relaxing. It was just so amazing I can’t describe how happy I was throughout my stay. Oh and on the last night of my stay, Tina arranged a surprise dinner for me! It was so awesome. The food was amazing throughout and the chefs were always so patient and generous to me. I was full throughout my stay! 5. Best spot for a selfie at the lodge? 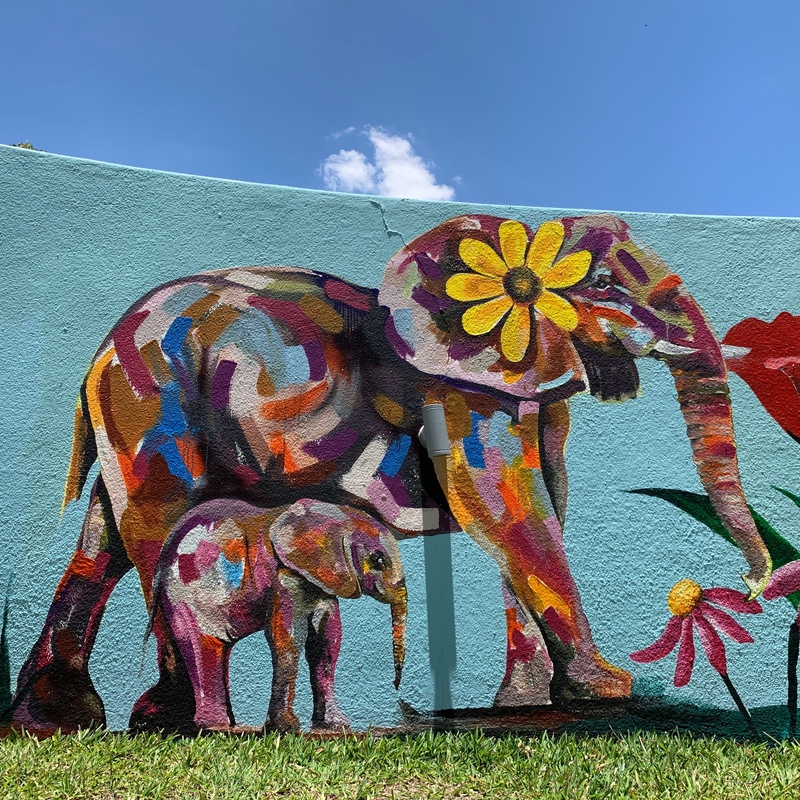 At the pool by the elephant mural, the restaurant with the mural of the woman with sunflowers in her hair and near the bar at River Lodge, and also on the sunset cruise! 6. Favourite time of day at the lodge? Eating time and sunset cruise time.